Saurashtra’s financial hub Rajkot is all set to get a new lake, thanks to Rajkot Municipal Corporation (RMC). 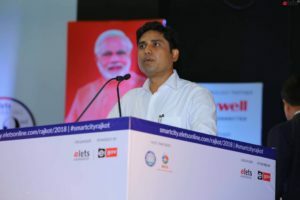 In an interaction with Elets Technomedia Pvt Ltd, Banchhanidhi Pani, Commissioner, RMC and Chairman, Rajkot Smart City Development Limited (RSCDL) revealed that three new lakes are being developed in the city under the Area Based Development (ABD). “In the 150 years of its existence, a new lake is being developed in Rajkot. Its is one of the three lakes to be developed under ABD. We are developing 36 lakh sq meter of area in ABD,” said the Commissioner. The city has already implemented Eye-Way project under which 1,000 CCTVs are being installed all across the city. The project was launched by Chief Minister Vijay Rupani at Elets Smart City Summit, Rajkot. “The integrated Command and Control Centre is ready. We are monitoring the crime, the traffic situation, Solid Waste managsmene vehicles through it. We have drainage and water Supervisory control and data acquisition (SCADA) system in place. We monitor which zone used more water. There are 9 sectors and 24 parameters being monitored”, he said. The Rs 69 crore project is jointly funded by RMC, home department of Gujarat and also by public contribution. In the first phase, 487 CCTV cameras have been installed at important junctions and public utilities in the city. These cameras will detect red light violation, recognise registration numbers of vehicles violating traffic rules and generate e-challans and will also keep an eye on an open plot of RMC on pilot basis. Along with the camera, 20 environment censors have also been installed.